The Orange Camera app for iPhone, iPod Touch, and iPad is a fun, quick, and easy way to add dramatic effects to your iOS photography. The Orange Camera iPhone photography app immediately opens its in-app camera, and you are treated to a home screen with a grid of nine effects. Using responsive, agile gesture controls, you can scroll through a total of six screens with nine different effects equalling 54 options. You may also choose to simply touch the arrow buttons at the bottom of the screen to scroll through the Orange Camera iPhone photo app effects. The photo effects have an incredible range from pixellated black and white to bright pop-art perspectives to exaggerated carnival mirrors. When you select the effect, you get a chance to see the screen filled with the image and the effect. You can quickly snap a photo, or you can touch the photo icon in the upper right hand corner of the screen to select an existing photo saved in your iPhone, iPod Touch, and iPad app. After you have snapped or chosen a photo, you may share to Twitter and Facebook with one touch. You may save to your iOS libraries, as well as email to a contact from your iPhone, iPod Touch, and iPad list. One of the interesting features incorporated in the Orange Camera iPhone app is the ability to create mirror images. As with all of the functionality and navigation in the Orange Camera iOS photography app, it is a simple and quick gesture that accomplishes this task. 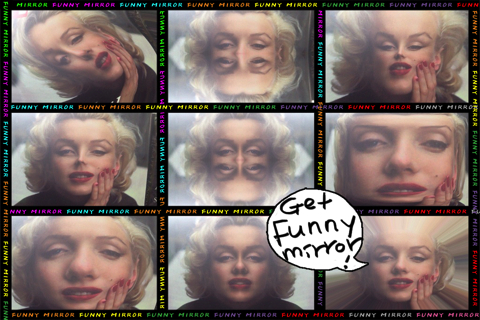 With a touch on the reverse arrow button at the bottom of the screen, the mirror image instantly appears in the nine effected grids on the screen. The Orange Camera iPhone, iPod Touch, and iPad app is a fun, solid choice for adding hip effects to your photography. The $1.99 price tag is a bit strong, as other photography iOS apps offer more features for a similar price. The simplicity of use and accessibility makes the price more appealing and fair to those who want a simple interface to use iOS photo effects. 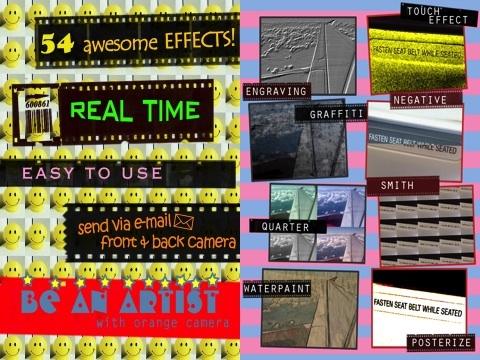 AppSafari review of Orange Camera was written by Jenni Ward on July 2nd, 2012 and categorized under App Store, iPad apps, Photos, Universal, Video. Page viewed 4217 times, 1 so far today. Need help on using these apps? Please read the Help Page.